Last Sunday, the Dickinson Press carried a story about the proposed new Little Missouri River crossing near the Elkhorn, Theodore Roosevelt’s 1880’s Bad Lands ranch, now a National Park site. It was a precursor to two public hearings scheduled later in the week on the bridge project. In the story, reporter Ashley Martin quoted Billings County Commission Chairman Jim Arthaud as saying that the bridge would cost $15 million and that Billings County was going to pay for it. More about that later. On Tuesday, the Federal Highway Administration, operating under the auspices of the Billings County Commission, held the first of two public hearings as part of the National Environmental Protection Act. Here’s a story from the Bismarck Tribune about that hearing. On Wednesday, the National Trust for Historic Preservation announced that the Elklhorn has been named one of the Trust’s 2012 Most Endangered Historic Places, a story which drew national media attention, with stories like this one in the Washington Post carried by newspapers and posted on websites coast to coast. On Thursday, the second of the two public meetings was held in Medora, and about 100 people showed up, probably 60 per cent of them to oppose the bridge and the rest, mostly Billings County residents, to find out how Jim Arthaud was going to spend $15 million of their tax dollars. Turns out that number is a little high—maybe by about $10 million—and the federal government will probably get the bill for 80 per cent of that, but the Billings County Commission says it has really spent about $700,000 planning the project. So far. If I were a Billings County resident, I’d be pretty pissed about that. Also on Thursday, The New York times carried an op-ed piece by Edmond Morris, one of America’s pre-eminent biographers, whose three-volume life story of Theodore Roosevelt is among the classics of American Literature (and a Pulitzer Prize winner), declaring the Elkhorn off-limits to development and calling on President Obama to name the site a National Monument. On Friday, Lauren Donavon’s Bismarck Tribune story about the hearing in Medora quoted Ron Jablonski, District Ranger in the Bad Lands for the U.S. Forest Service as saying his agency was opposed to having a road through the property they own, across the river from the Elkhorn, to facilitate the river crossing. 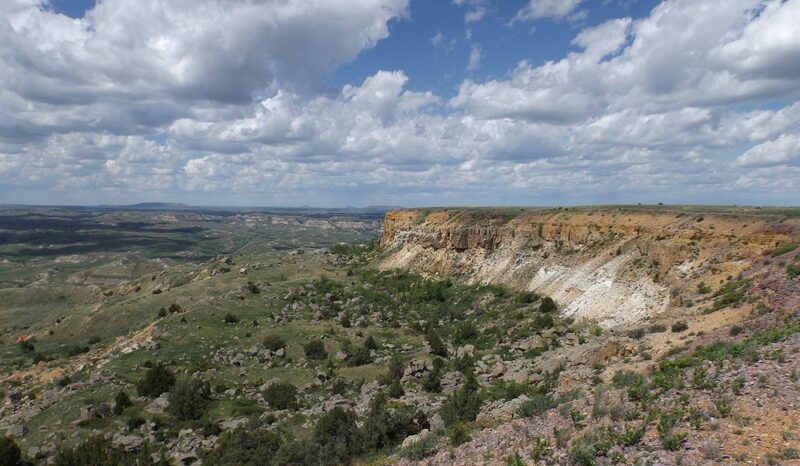 And Theodore Roosevelt National Park Superintendent Valerie Naylor said she and the National Park Service would do all they can to stop the project from being built near the Elkhorn. I’m going to gather a few of my thoughts and share some research I’ve done on this project later this week. Stay tuned. According to the newspaper, this is a true story: A 29-year-old Max, ND woman was cited for careless driving and no child restraint after she was caught driving while breastfeeding. Authorities received a 911 call Thursday afternoon about a possible drunken driver on Highway 83 near Coleharbor. A McLean County deputy located the driver and stopped her after seeing the vehicle nearly broadside a semi. According to his report, the driver was breastfeeding her infant and talking on her cellphone while driving. The vehicle she was driving did not have plates. The story says oil companies in North Dakota reported more than 1,000 accidental releases of oil, drilling wastewater or other fluids in 2011. Sheeeeitttt. More than 1,000! From the story: “Under North Dakota regulations, the agencies that oversee drilling and water safety can sanction companies that dump or spill waste, but they seldom do: They have issued fewer than 50 disciplinary actions for all types of drilling violations, including spills, over the past three years. State officials say they rely on companies to clean up spills voluntarily, and that in most cases, they do. Mark Bohrer, who oversees spill reports for the Department of Mineral Resources, the agency that regulates drilling, said the number of spills is acceptable given the pace of drilling and that he sees little risk of long-term damage. Kris Roberts, who responds to spills for the Health Department, which protects state waters, agreed, but acknowledged that the state does not have the manpower to prevent or respond to illegal dumping.” Oil Patch residents are frustrated. At least 15 of them have gone directly to the EPA with complaints. But Congress has largely delegated oversight of oil field spills to the states. The story quotes EPA spokesman Richard Mylott saying the agency investigates complaints about releases on federal lands, but refers complaints involving private property to state regulators. So ranchers with complaints that the state won’t act on really have nowhere to go. You can take a look at ProPublica’s website here. GEE, COULD I HAVE MORE TIME TO THINK ABOUT THAT? The Forum, at the end of ProPublica story on its website, has one of their reader surveys. Today’s question: “Is North Dakota allowing oil production to increase at a pace that is harmful to the environment?” A thoughtful question, and one we’ll all be eager to see the results of from The Forum’s mostly-eastern North Dakota readers. Well, it’s pleasing to see that. But here’s MY question: This is a voluntary survey on a newspaper website. It asks a simple “Yes” or “No” question right there on the page at the end of the story. What’s your opinion on this issue? So what’s up with those 24 people who took the trouble to click on the link, go to the new page, and then answer “Don’t know?” Sheesh. You can go here to see the latest results.